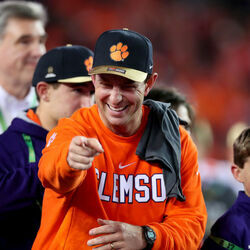 How much is Dabo Swinney Worth? 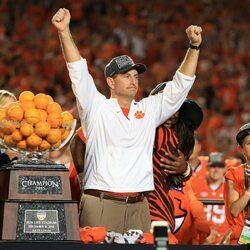 Dabo Swinney Net Worth and salary: Dabo Swinney is an American college football coach and former player who has a net worth of $20 million. Born William Christopher Swinney in 1969 in Birmingham, Alabama, Dabo Swinney played college football as a wide receiver close to home for the University of Alabama Crimson Tide from 1990 until 1992. Swinney's coaching career began as a graduate assistant with Alabama in 1993. Three years later, the Crimson Tide promoted him to the team's wide receivers and tight ends coach. He left the sidelines from 2001 until 2003 to work as a real estate developer in his home state. In 2003, Clemson hired Swinney as an assistant head coach and wide receivers coach, and, five years later, he was promoted to the team's head coach. Swinney has remained the head coach of the Tigers ever since, and is currently in the role as of 2014. To date, he has amassed a 89-28 career win-loss record to go along with a .500 coaching record in bowl games with the Tigers. 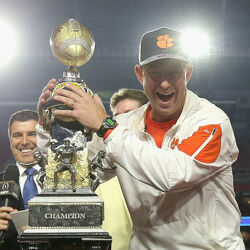 Swinney won one ACC championship in 2011, the same season he earned Bobby Dodd Coach of the Year honors. Swinney has three sons with his wife, Kathleen Bassett, whom he wed in 1994. 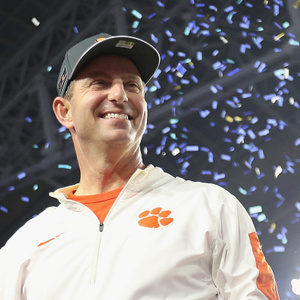 On January 9, 2017, Dabo Swinney led Clemson to defeat Alabama at the College Football Playoff National Championship. On August 25, 2017, Dabo signed an 8-year $54 million contract with Clemson. That breaks down to around $6.75 million per year and will keep him with the team until 2024. The contract also comes with a $6 million buyout clause if either party ever wants to go in a new direction.